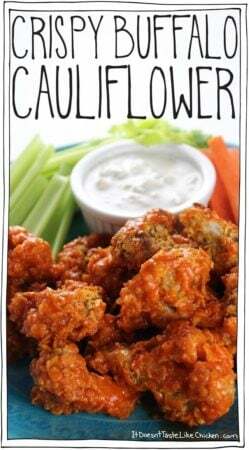 It’s finally here, my Vegan Butter Cauliflower recipe! 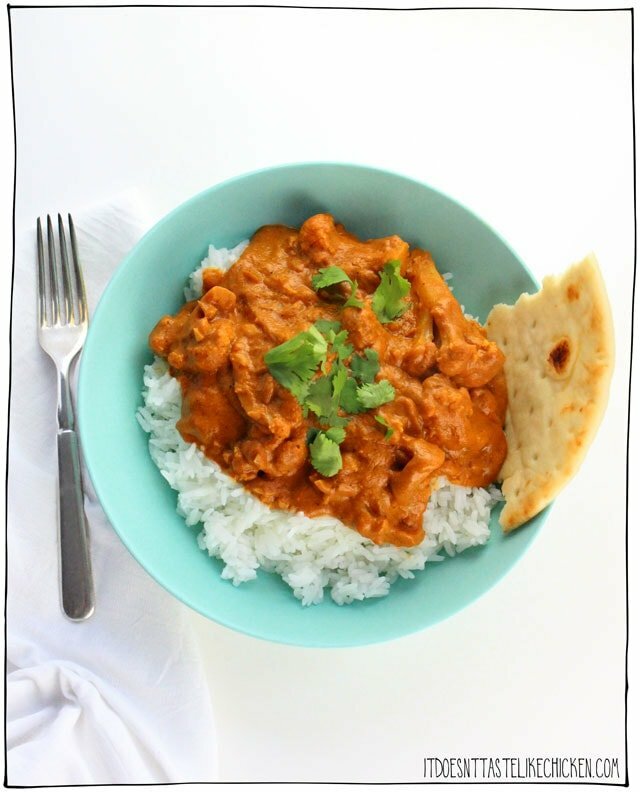 This is my version of butter chicken… but without the butter and without the chicken. This recipe took a lot of testing to make it oh so perfect, and I am so excited to finally share it with you. 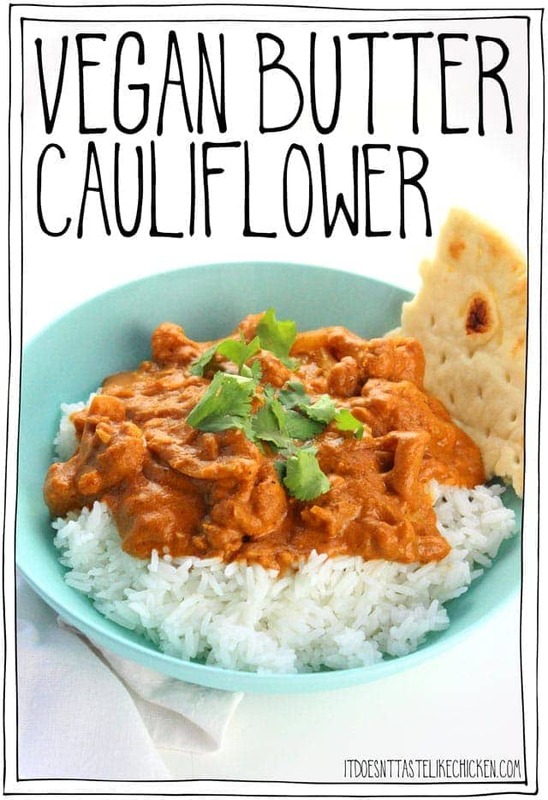 Not only was I looking for excellent vegan replacements for both butter and chicken, but after discovering that a lot of traditional butter chicken recipes required an entire cup (!) of butter and additional cups of whipping cream, I cringed, and knew I wanted to make this one a little healthier too. So I present you my (mostly) guilt-free Vegan Butter Cauliflower. Tah dah! 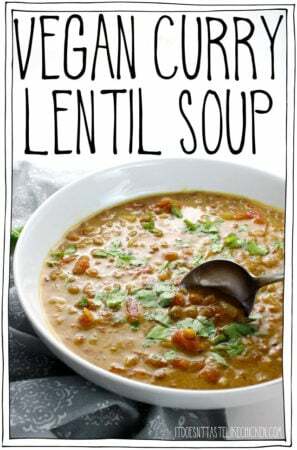 This recipe happens to be super easy too, in true fuss-free vegan style. Just add raw cashews, tomato paste, and a bunch of spices to a blender, and you’ve just made your sauce. Then add two tablespoons of vegan butter (I still wanted a bit of that butter taste, but reduced it by a whopping 14 tablespoons), saute up some onion and garlic in a pan, pour in the sauce, add the cauliflower florets, and simmer until tender. Yep, it’s that easy peasy! And oh man does it taste fantastic!! I’ve been eating this pretty much every day for a week because I’m madly in love. Creamy tomato-y goodness, packed full of spices, just so much deliciousness in a bowl it’s difficult to comprehend. Serve it up with some rice, naan bread, and a little cilantro, and be prepared for comfort food heaven. To make Vegan Butter Cauliflower: add all of the ingredients to a high-powered blender and blend until smooth and creamy. If you do not have a high-powered blender, you may want to soften the cashews first by boiling them in water for 10 minutes, draining, and then adding to the blender with all of the remaining ingredients. This will ensure a smooth sauce. For the butter cauliflower, melt the vegan butter in a large pan or pot. 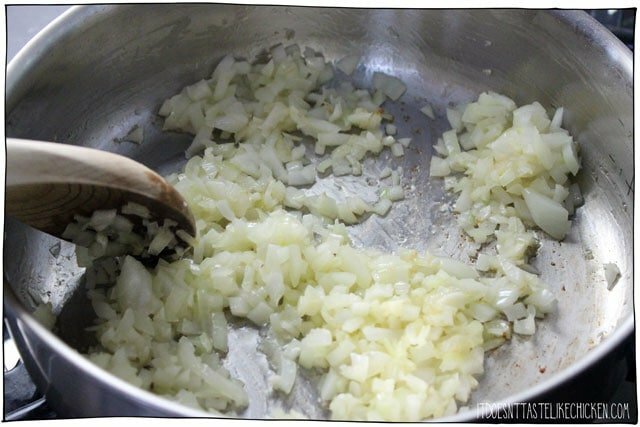 When melted add the onion and garlic and sauté until the onion turns translucent and just begins to brown. 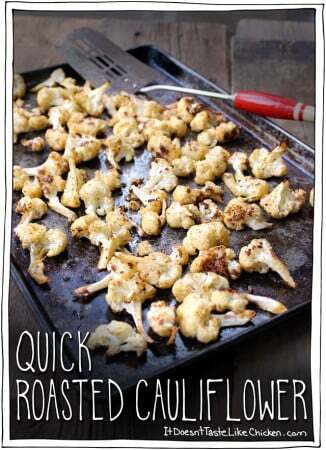 Pour in the prepared sauce and stir in the cauliflower florets. Cover and bring to a simmer. Stir the cauliflower often so the sauce doesn’t burn on the bottom of the pan. Cook until the cauliflower is fork tender, about 10 minutes. Serve over rice with a side of naan and a garnish of cilantro. 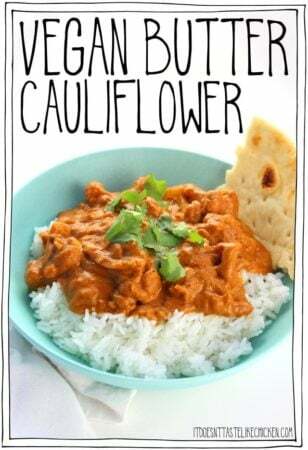 Indian butter chicken has been veganized! I present you Vegan Butter Cauliflower. A fraction of the calories and fat, but tastes even better. Super easy and quick to make, making a perfect weeknight meal. For the sauce, add all of the ingredients to a high-powered blender and blend until smooth and creamy. If you do not have a high-powered blender, you may want to soften the cashews first by boiling them in water for 10 minutes, draining, and then adding to the blender with all of the remaining ingredients. This will ensure a smooth sauce. For the butter cauliflower, melt the vegan butter in a large pan or pot. When melted add the onion and garlic and sauté until the onion turns translucent and just begins to brown. Pour in the prepared sauce, and stir in the cauliflower florets. Cover and bring to a simmer. 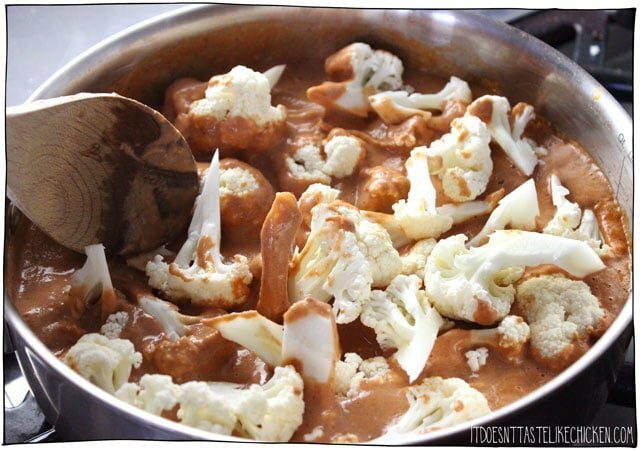 Stir the cauliflower often so the sauce doesn't burn on the bottom of the pan. Cook until the cauliflower is fork tender, about 10 minutes. Serve over rice with a side of naan and a garnish of cilantro. Tag @itdoesnttastelikechicken on Instagram and hashtag #itdoesnttastelikechicken. Had this dish at a friends last night for dinner. It was so delicious! I have just gotten back from St.Lawrence Market with the ingredients. I’m looking forward to making it! Absolutely delicious and easy meal Sam! Perfect! I struggle to find vegan meals that my step son will eat and this was a winner. Thanks so much!! On my plate I added half of a diced mango, for the fresh touch. I would try making my own garam masala and simply omitting the cinnamon. This recipe doesn’t even call for cinnamon. Hope that helps! I made this last night and I am currently enjoying a leftover bowl at my desk at work! Another fantastic recipe! I didn’t have cashews so I made a roux instead, and it was amazing! I added some potatoes, too. The whole family loved this recipe. I was looking fo something easy AND tasty and this recipe delivered on both – even leftovers are lick-the-bowl worthy! It’s creamy with a buttery after taste… fabulous! My three year old cleaned his plate!!! Win! My husband and I loved it too. 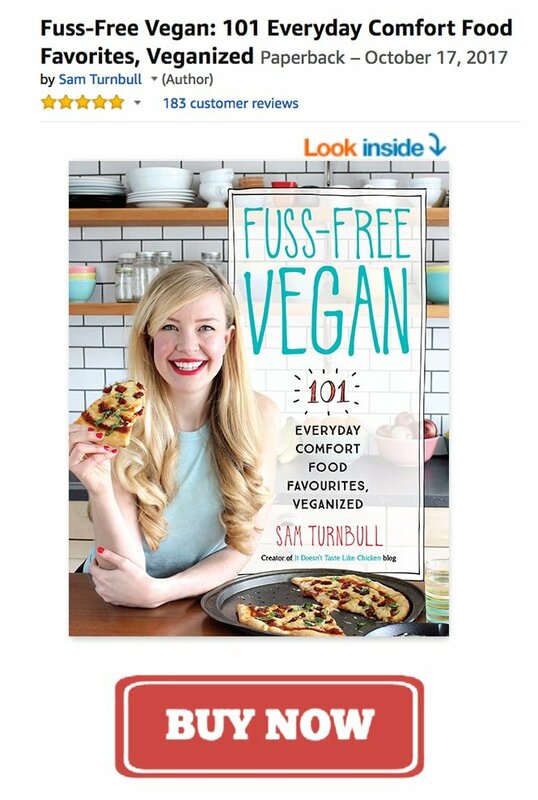 Our copy of Fuss Free Vegan arrived today, and this recipe just made me excited to try so many more – thanks! Aw that’s wonderful!! So thrilled you are enjoying so many of my recipes, Kerry-Anne. I hope you love the book! This was brought to my attention because of your “Best of 2018′ list and got devoured yesterday evening (along with some rice and soy yogurt). Yum! 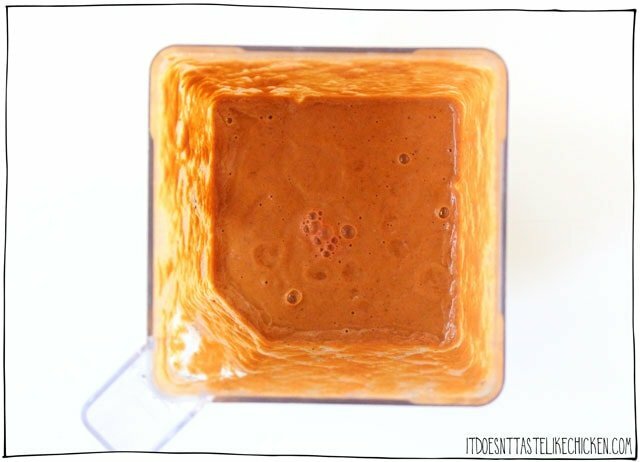 That sauce is insane and going to be a staple from now on – omni hubby loved it, too. 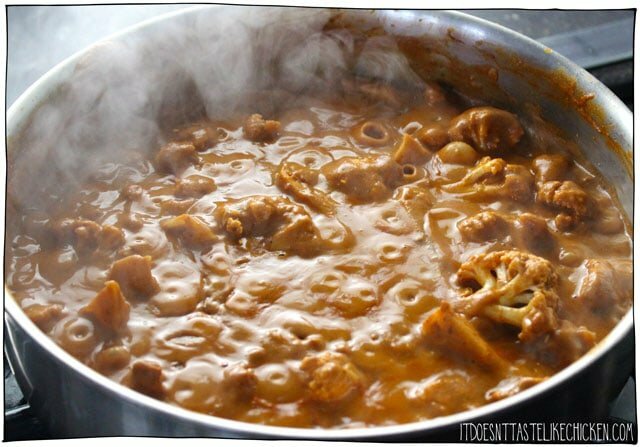 Next time maybe with broccoli and chickpeas instead of the cauliflower…. getting hungry again :D. OMG!! I made this tonight for supper!! It was soooo good! 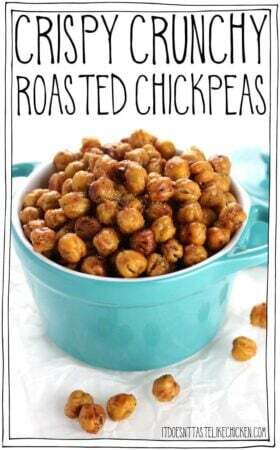 I will definitely be making this again and want to add some chic peas to the cauliflower next time.. Can’t wait for supper tomorrow night to enjoy the leftovers! Simple and absolutely delicious! Im not a HUGE cauliflower fan but i love trying new recipes. If it’s made of plants, I’ll try it! This one is a keeper! Also I added peas upon reading another’s comment. Great addition! This recipe is a hit! Ive made it for my 9 year old, my entire class, and my husbands co workers. This is a go to for potlucks. I am always having people ask for the recipe. This is a go to when company is over in my home. Thanks for this recipe!! This was BOMB!! So delicious and so healthy! I used extra tablespoons of Miyoko’s Vegan butter cause it’s so good I couldn’t help myself. I dont eat rice so I served this with a vegan coconut flour naan recipe I found on another site https://myheartbeets.com/coconut-flour-naan/print/12145/. Thank you for creating such a masterpiece, soooo grateful!! 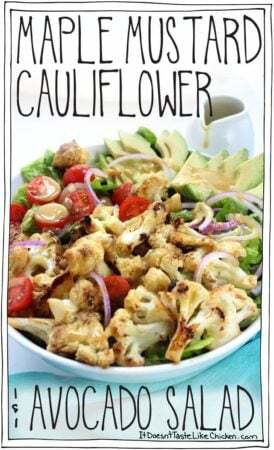 I am not a great lover of cauliflower but this is amazing. My meat eating husband enjoyed it and said he would have it again. Thanks for your recipes- I love trying new ones out. What is best to use in place of cashews? I only made this yesterday and I used LSA, tasted great. Blanched almonds or macadamia nuts will work well. Enjoy! Ive made this a few times and loved it. I am making it for a potluck at work, do you think that it will be okay if i warm it in a crock pot to serve? Also do you think cashew butter would work instead of cashews? That is all i have on hand right now. Warming it should work fine. Cashew butter might work ok, but the result would be different as the cashews are blended to the point of the oil being released to make cashew butter. Hi Sam. I’m loving your recipes! I tried the vegan butter cauliflower and found it way too acidic. Is there a way to get around that? The acidity would come from the tomato paste, so you could reduce to taste. This is very good. I have never had it before so I do not have anything to compare it to. This is another keeper! This is really good! I had this cauliflower that was about to pass out and I had to save it, found this recipe and almost had all the ingredients, except I didn’t have a can of tomato paste, I had a little from a tube but I used ketchup instead and it was great!! It must’ve been a bit sweeter but to me it was perfect to balance the spices, I’ll definitely do it again! Howdy! I was wondering what brand of vegan naan bread you buy, and where?? I’m building my weekly meal plan and would love to make this!! I just bought this naan bread in my local grocery store which happened to be vegan. You could also use a fluffy pita bread if your grocery store doesn’t carry naan. Hi derin! Yes, I imagine it should work fine. It’s never lasted longer than 4 days in my house, but that’s because I devour it all quickly, but it should keep well. Enjoy! Would love to try this recipe. We are trying to avoid oils right now, so I use a lot of water/vege stock to simmer things like onions. Would that work in place of the vegan butter? Is there something out there that could replace the butter flavour while still being oil-free? Not that I know of! You could just skip it and do a broth sautee. Enjoy! You could try using coconut milk, but then it will taste more like a coconut milk based curry and not as much like a butter flavour. I bought a package of Upton seitan the other day. Think it would work crumbled into this, at the end, for a boost of extra protein? I’m sure it would be fine. Enjoy! My whole family loved this recipe!! I did also add half a cup of lite coconut milk and 2 TBSP of Agave. It’s definitely a Keeper!!! Wonderful, so happy you enjoyed it! I’m going to make this in an electric pressure cooker. What do you think? It was delicious. I made it in the pan! Everything has to be blended to smooth creamy consistency, so I am not sure how you would do it without a blender! Do you use a large or small or maybe even a medium onion for this recipe? Making it tonight!. Made this tonight and my family loved it! Even my husband who is on the fence when it comes to Indian food. It made so much sauce I added some peas and beans too. It was So delicious! My 10 month old ate until her bowl was clean. Finally tried this tonight and it was delish. Sadly my blender didn’t get the cashews finely blended (I boiled them first) but it didn’t really matter. Thanks Sam!! I made this for my family last night and it was fabulous. 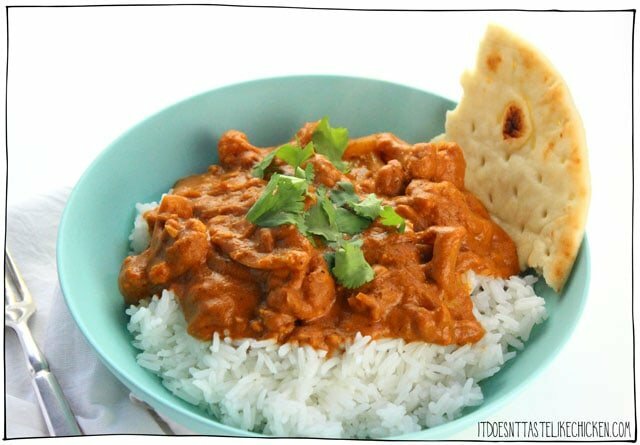 I have been eating Indian my whole life (it was the first solid food I had as a baby) and this recipe was truly amazing. It was tangy, creamy, and delicious. I haven’t had butter chicken since I was 14 (now 41) and this brought me back. My 9 year old also loved it. I made two batches for leftovers and sent some over to my meat eating mom. Bravo – you knocked it out of the park and I look forward to trying more of your recipes! Thank you! The whole family loved this. I left out the chili and cumin because I have a few picky eaters and it was mild and delicious. Going to be a staple around here now. Thanks for another awesome recipe as always Sam!!! Another rave review! Delicious and SO easy! Thanks Sam! This is truly fantastic! Talk about comfort food! I agree with everyone else who is raving (in a good way). Thanks for making easy vegan food. How about turning your awesome skills to ropa vieja?? Made this for dinner tonight and the whole family loved it! I echo the commenter when appreciated using a whole can of tomato paste! ;). Another keeper Sam!! Yum! I made this this weekend but with roasted potatoes instead of cauliflower and it was DELICIOUS! This sauce is amazing and would literally taste good on an old shoe. And I have to give you major kudos for developing a recipe that uses and an ENTIRE can of tomato paste. I always get annoyed when recipes call for 1 tablespoon of tomato paste since I very rarely end up using the remaining tomato paste. Thanks so much! I’m back! Just had to add that I made this again but with the cauliflower this time…WOW! It was amazing with potatoes but even better with the cauliflower! I will definitely be making this again and again. Thank you! Hi, I know you like to use easy to fi d ingredients in any grocery store, but Is garam masala easy to find? It’s a pretty common spice mix and my local grocery store carries it, so I think it’s pretty easy to find. If not you could try ordering it online on Amazon. Hope that helps! Sam, another amazing recipe from you. Just made this tonight and it was amazing yet so simple to do. This is going to be another one of my staples in the house. Thanks so much and keep up the great work and recipes. You are my favourite vegan chef. Awesome!! Thrilled you enjoyed it so much, Erica! That’s awesome! Thrilled you enjoyed it so much, Ness! Made this in a big hatch and added parboiled mini potatoes, and it was fantastic. Thank you so much, Sam!!! Keep up the good work, Sam! Planning to try the BBQ pulled jackfruit this weekend! This was beyond delicious. I added chick peas and crimini mushroom. Swapped out the rice for quinoa. I can not wait to go home for lunch. Super easy. Super yum. Super thankful to you for posting this recipe. WOW! Never heard of this dish, but will enjoy It often. Made the sauce ahead and marinated strips of tempeh overnight in it. Added cooked mushrooms chunks too since I had no knowledge of how cauliflower could have the “tooth” of chicken… This is a keeper! Thank you so much for your creativity and excitement for coking vegan! This is outstanding! The blend of spices is so good. I agree with the other reviewer who said you could put just about anything in the sauce, it is so addictive. I am putting this on my list of good recipes to take to a party. Thanks, Sam! We are eating this right now–this sauce is fantastic. We are huge butter chicken fans so I was a little skeptical, but now just blown away. I didn’t have cauliflower so I used seitan, but I’m not sure it matters what you put this sauce on. It could stand alone with just some good bread. You are a genius– thank you!!!! Made this tonight. AMAZING! I have wanted a vegan version of butter sauce for so long! I never knew cashews could make things so creamy. Thank you!!! YAY! Thank you, Darca!!! Thrilled you enjoyed it so much. And yes, cashews are amazing like that!! can I sub minced ginger for powdered? if so, would the measurement be the same? For sure! I would add the fresh ginger to the pan with the onion and garlic (instead of to the blender), and I would double the amount, about 1 teaspoon minced. Enjoy! Sounds delicious! 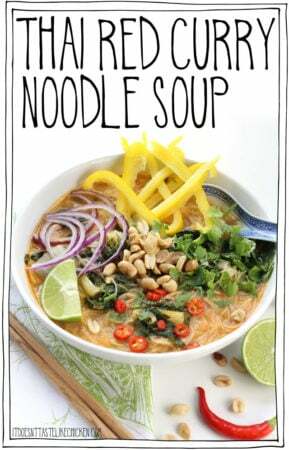 I’m making this and your ramen noodle soup this week! Can’t wait. What brand of vegan butter do you use? Thanks.